Some people may not class this as an anime due to it being produced by Nickelodeon, but I recommend this to you all anyway. 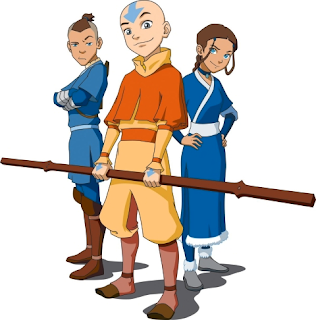 Avatar: The Last Airbender follows the story of Aang, a 12-year-old boy who turns out to be the Avatar, a person who can master the bending of all 4 elements: Earth; Water; Fire: and Air. He is found in an iceberg by siblings Katara and Sokka who are part of the Southern Water Tribe. From there his journey begins, along with Katara and Sokka, to master the other elements in a bid to end the 100 year war between the Fire Nation and the other Nations that started in Aang's absence. Book 1 of Avatar: The Last Airbender shows us the trio's journey from when Aang is found by Katara and Sokka to when they reach the North Pole and other events that take place there. But it's not just about them, for in the first episode we meet their enemies, Prince Zuko of the Fire Nation and his Uncle Iroh. Zuko seems to have a desire to hunt down the Avatar due to being banished from home by his father Fire Lord Ozai, but his honour can be restored should he defeat the Avatar. Include other characters they meet along the way, such as those who wish to take the glory of defeating the Avatar, and you have a many-layered but very interesting story. What's more, you come to know what's been happening whilst Aang was trapped in the iceberg, which I won't spoil for you here. There are only 20 episodes in Book 1, and you won't be wasting your time watching any of them. Each episode is full of quality in terms of story and characters, each of which are affected by the events that occur in them, adding even more depth to both elements and shows just how much effort the producers put into making the series. After watching this season, you'd want to watch the other two, but they don't tie up all the loose ends. I will explain this in Book 3, unless you wish to do so in the comments (I won't bite). I must tell you all though, if you don't know about the film adaptation of Book 1 or haven't yet watched it, DO NOT watch it! I have seen it, and it doesn't live up to the Avatar name. If you still don't believe me, I will review the movie soon and provide the link in this post too. If you want a very deep story with a great mix of characters that add to it, this is the one for you. This quality continues on in the other two seasons, and you'd just want to watch the whole series again. A 12-year-old boy is found trapped in an iceberg by a brother and sister, who travel the world with him so he can master all 4 elements in order to end a century long war.